No two liquids have exactly the same boiling point. Therefore it is possible to separate any mixture of two liquids by raising the temperature of the mixture to a point where one of the liquids will boil but the other will remain liquid. This apparatus consists of a 300mm Liebig condenser, a Kjeldahl distilling column with a 50mm diameter bulb, a 500mL Boiling Flask, a support rod, clamp, and base, an iron tripod, wire gauze, 75mm funnel and 500mL Erlenmeyer flask. Caution: Not a toy; use only in a laboratory or educational setting. 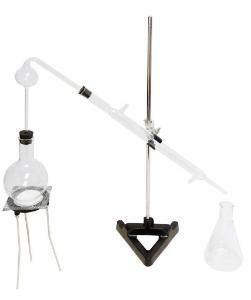 As with any apparatus used in the chemistry classroom, care must be taken to ensure safe operation. It is the responsibility of the instructor to take all necessary precautions. Proper protection should be worn to protect the eyes and skin.